Bombardier Inc. announced Thursday it will shed 5,000 jobs company-wide and sell off two units as part of chief executive Alain Bellemare's five-year plan to rein in costs, focus on rail and business jets and reduce the net long-term debt of $9 billion. The company said it will sell its Q400 turboprop aircraft program to a subsidiary of Longview Aviation Capital Corp. for about US$300 million. The Montreal-based company also announced the sale of its flight training business to CAE Inc. for about US$645 million. The restructuring, announced alongside Bombardier's third-quarter earnings, is slated for completion within 18 months and for savings of $250 million annually. Dropping the Q400 will allow Bombardier to zero in on producing its Global series of long-range business jets, including the Global 7500, whose first aircraft is slated for delivery next month. "With the measures announced, we are confident that we will be able to reach our goals in 2020," Bellemare said during a conference call. Bombardier shares tumbled by more than 20 per cent to $2.53 in mid-afternoon trading on the Toronto Stock Exchange due to concerns over cash flow. Bombardier forecast 2019 revenue to increase by 10 per cent to at least $18 billion, powered by more deliveries of its Global 7500s. 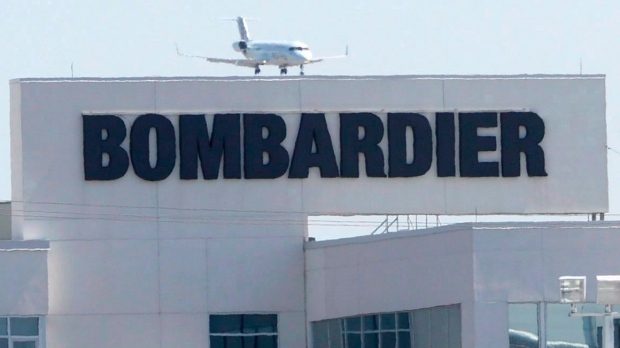 Free cash flow came in "well below" expectations that Bombardier could break even on cash without falling back on its $635 million in proceeds from the sale of a Toronto plant earlier this year, said analyst Benoit Poirier of Desjardins Capital Markets. "The new facility at Pearson (airport) will probably be producing only the Global business jet, and having a dedicated facility for one line gives them a chance to optimize the performance," said Ernie Arvai, a partner at commercial aviation consultancy AirInsight. "The next question for Bombardier is what happens with the CRJ line and what happens with the rest of the commercial business." Bellemare said at the time the company was committed to the Q400 and CRJ. "We like these products, they give us critical mass." He offered similar sentiments Thursday. "On the CRJ, the focus is still on reducing cost and selling aircraft today. We are losing money on the CRJ." Karl Moore, an aviation expert at McGill University's Desautels Faculty of Management, said the layoffs and selloffs will allow Bombardier to shift away from regional jets and shrink its debt. "The transportation side and business jets are clearly the central focus of Bombardier going forward," Moore said. Quebec Premier Francois Legault weighed in after speaking with company and union leaders. "My government will make every effort to minimize the number of job losses and to help affected employees find a new job," he said on Twitter in French. The changes came as Bombardier reported a profit of US$149 million or four cents per share in its latest quarter, compared with a loss of US$100 million or four cents per share in the same quarter last year. Revenue in what was the company's third quarter totalled $3.64 billion, down from $3.84 billion a year ago. On an adjusted basis, Bombardier said it earned four cents per share in the quarter compared with a break-even result in the third quarter of 2017, beating analyst expectations. Longview Aviation, the parent company to Viking Air Ltd., said once it completes its deal with Bombardier it will become North America's largest commercial turboprop aircraft manufacturer. The agreement encompasses the entire Dash 8 program, including the 100, 200 and 300 series and the in-production Q400 program. "The Dash 8 turbo-prop is the perfect complement to our existing portfolio of specialized aircraft including the Twin Otter and the Canadair CL 215 and 415 series of water bombers," Longview Aviation chief executive David Curtis said in a statement. CAE president Marc Parent said in a statement its purchase of Bombardier's flight training wing "represents a win-win for both companies, resulting in enhanced core focus."